One man describes the events that unfolded when his Roomba ran over dog poop, spreading a 25-foot trail of feces throughout his house. In a Facebook post, Jesse Newton said his dog, Evie, defecated in the living room at some point between midnight and when his vacuum cleaning robot was set to run at 1:30 a.m. When Newton‘s 4-year-old son awoke at 3 a.m. to crawl into bed with his parents, Newton smelled a strong odor. He got out of bed and walked into a “war zone of poop” in his living room. Newton documented the dramatic saga that unfolded as a cautionary tail to others. 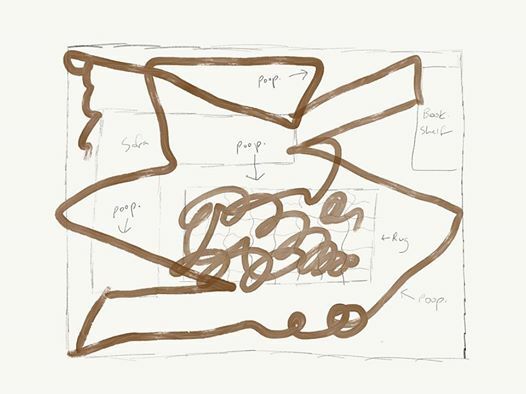 The post, complete with a hand drawn map of the poop trail, has since gone viral with more than 140,000 reactions and more than 200,000 shares. Newton was not so lucky. He recounts his attempts to clean the copious amounts of dried poop from his living room and a failed effort at using a rug shampooer to remove poop from the rug where it all started. “Some folks would shrug their shoulders and get back in bed to deal with it in the morning. But you're not one of those people,” Newton writes of himself. Instead, in the early hours of the morning, he attempted to clean the Roomba but forgot to take the batteries out before soaking it. As the waterlogged Roomba sputtered to its death, Newton had some harsh words. But the tale has a happy ending. After a week of trying to fix the costly device, he called the store where he purchased the Roomba and told them the story. The purchase came with a lifetime warranty. "They are replacing the Roomba that ran over dog poop and then died a poopy, watery death in the bathtub - by no fault of their own, of course," Newton wrote on Facebook. This is one experience that won't soon be flushed away. Jesse Newton with Kelly McQueen Newton. And then the horror. Oh the horror. So, first you clean the child. You scrub the poop off his feet and put him back in bed. But you don't bother cleaning your own feet, because you know what's coming. It's inevitable, and it's coming at you like a freight train. Some folks would shrug their shoulders and get back in bed to deal with it in the morning. But you're not one of those people - you can't go to sleep with that war zone of poop in the living room. So you clean the Roomba. You toss it in the bathtub to let it soak. You pull it apart, piece-by-piece, wondering at what point you became an adult and assumed responsibility for 3:30am-Roomba-disassembly-poop-cleanups. By this point, the poop isn't just on your hands - it's smeared up to your elbows. You already heard the Roomba make that "whirlllllllllllllllll-boop-hisssssssss" noise that sounds like electronics dying, and you realize you forgot to pull the battery before getting it wet. More on that later. But there's a light at the end of the tunnel. After spending a week researching how to fix this damn $400 Roomba without spending $400 again - including refurb units, new motherboards, and new batteries - you finally decide to call the place where you bought it. That place called Hammacher Schlemmer. They have a funny name, but they have an awesome warranty. They claim it's for life, and it's for any reason. So I called them and told the truth. My Roomba found dog poop and almost precipitated World War III. So, mad props to Hammacher Schlemmer. If you're buying anything expensive, and they sell it, I recommend buying it from them. 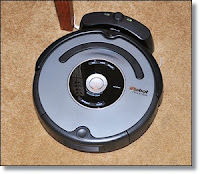 And remember - don't let your Roomba run over dog poop.